That's the impression I got from a new report about the future of human-computer interaction from IT analysts Gartner, based in Stamford, Connecticut. 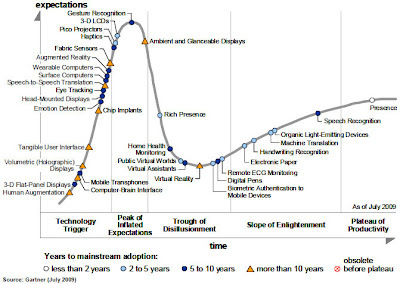 Gartner's now-classic chart, shown right, shows the rollercoaster of expectations ridden by new technologies: rocketing from obscurity to a peak of overblown hype, then falling into a "trough of disillusionment" before finally becoming mainstream as a tech's true worth is found. Today's true power users of voice recognition are people who are physically unable to use keyboard or mouse. For them, it is as much a medical device as an office aide. They have not only supported public and private research over the years, but also provided a market for the technology when it was far from perfect.